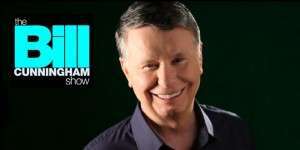 Bill Cunningham is a nationally recognized broadcaster, veteran attorney, and a business entrepreneur. Bill has been a prominent radio host, forging a reputation as someone who is not shy about expressing an opinion, or holding someone accountable. He’s been honored twice with a Marconi Award as “America’s Big Market Radio Personality of the Year” heard in more than 200 markets across the U.S. In 2011, Bill was named “one of the top 100 radio personalities of all time.” He served as an Assistant Attorney General in the state of Ohio. Bill and his wife the Honorable Penelope R. Cunningham of the Ohio Court of Appeals, both grew up in the Cincinnati area. They have one son and two grandchildren. He is a graduate of Xavier University in Cincinnati and the University of Toledo College Of Law. Cunningham airs 9pm to Midnight on Sunday on KZIM KSIM.